Something very cool has been built in West Waluga Park. 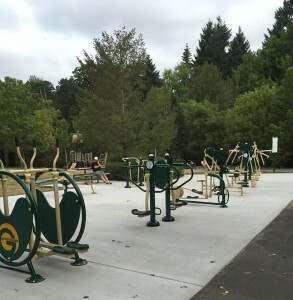 It’s an outdoor gym that is free to use. Equipment is there for all major muscles just like you would find at a place like LA Fitness or 24 Hour Fitness. The difference is that there is no roof or walls to keep out the wind or rain, and it’s free. Take a moment here and think about this. No, there is no roof to keep out the rain, but there is also no roof to block the sun and the fresh air. And did I mention that it’s free? The first time I used the equipment I was totally exhilarated by the feeling of what a great day to be out side and what a privilege to be able to work out in that environment. I have used the equipment many times. I have never found it so busy that I have to wait for others before I can take my turn. I do a lot of walking so I find myself using the upper body equipment. But I also enjoy the cross country machine and they have this machine that you stand on and swing your torso from side to side. I suspect it’s meant to work the sides of your waist, but I enjoy the movement. If you do decide to give it a go, be sure to read the instructions that are clearly posted on each piece of equipment. As with all exercise, it’s meant to be beneficial and not harmful, but you bear responsibility for doing it right. West Waluga Park also has a nice paved path around it’s circumference. So if you like the idea of getting in a brisk walk along with the weight training, you can easily do so all in one place. It’s a perfect set up for parents who’s kids want to play and you want to exercise and keep an eye on them. Yep, I’m a fan of the new fit spot. Located at 15775 Waluga Drive, check it out.